NEWS: On long-haul flights, Finnair is nearly doubling its inflight entertainment options, with a choice of 72 movies and more than 150 TV shows now available on demand in both Economy and Business Class. On Finnair's new Airbus A321s with Sharklets, you can now hire Samsung Tab 3 tablet computers at a cost of ?10. The remaining Finnair A340 long haul aircraft without AVOD are due to be retrofitted with AVOD within the next few years, or scrapped if the A350 arrives before their seats are replaced. 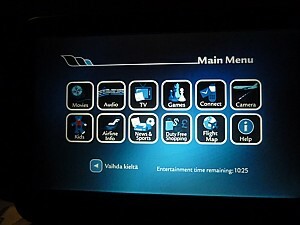 Whether you get a seatback TV with AVOD on the Finnair long-haul aircraft depends on the type of plane you are on, and also which variant of aircraft you get. Unless that is, you end up on the Finnair Boeing 757s, in which case you are so out of luck. They still only have overhead screens. 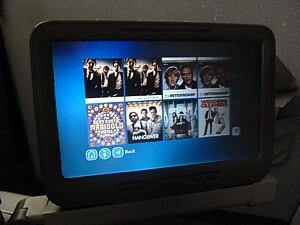 In general however the Airbus A340 and A330 are a delight, with seatback TVs in all classes, and an AVOD (Audio Video on Demand Inflight Entertainment System) which allows you to stop, start, pause and rewind films on demand, and with many more movies than on the traditional film loop systems. Inflight film listings are in the Blue Wing magazine in the seat pocket - and also come to that on screen. On most Airbus A330 and A340 the AVOD on demand systems is available at every seat, with 25 movies (75 movies on the latest A330), several TV shows, 60 music albums, radio channels and games. The system is a little slow, but not too bad. The only real issue is the rather slow way the screens scroll around pages of films - it's hard to browse for something you want to watch, and it won't show trailers either. Alas the whole system falls down when it comes to content - there really isn't a lot there. Sure, there are a few Hollywood films, but most of them are rather old 'recurrent', there are few blockbusters, and certainly no 'thinky' type films. It is very bland, and rather cheap. A camera on the front of Airbus aircraft shows a view from the outside of the aircraft during take-off and landing - a great feature, although with windy landings, your heart may skip a beat, and for seats at the front of business class you can't flip out the screen at these times. There is the usual airshow program which has a scrolling map, and tells the remaining flight time, the estimated arrival time, the local time, the temperature outside the aircraft and at the destination, as well as the speed and altitude of the aircraft. Alas, on the two older ex-Air France A340s (registration OH-LQF and OH-LQG - see the Finnair fleet page for details of how to spot them), the video options are much poorer. There are personal video screens in both classes, however there is no AVOD - the video system offers only 11 video channels, along with the Airshow real-time map. 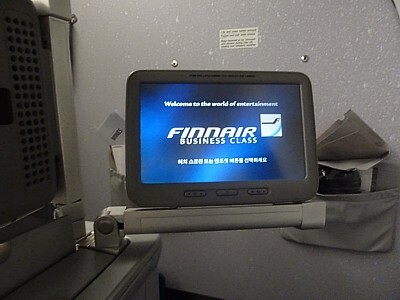 The main movies on flights are shown to coincide with their first nights in Finland. Details about films are given in the Blue Wings magazine. The blockbusters are on channel 1 or 2 - the films on these change according to the route - while channels 3, 4 & 5 are older films. There is comedy (channel 6) technology (7) style (8) plus a discovery, and sports channel. Channel 11 is the camera, and 12 is familiar moving map. The film selection is changed every three months. 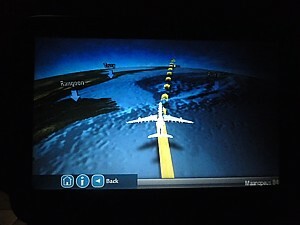 On the Boeing 757 there are overhead monitors with Airshow map system, movies and TV shows. In business class gameboy games are available for children. A loan of these can be requested from the cabin crew. On some flights you are provided with personal DVD players, and a choice of discs. For European flights using Airbus aircraft, there is some inflight entertainment. On flights over two hours, short half hour cartoons (like the Simpsons) and documentaries (such as wildlife programmes from Discovery). Unfortunately Finnair ordered aircraft without any headphones sockets at the seats, so you have to read subtitles. Even worse, you can end up with programmes that were originally English language, but with Finnish subtitles, and then English subtitles put over the top. All in all, it makes you wonder why Finnair bother. On Finnair's new Airbus A321s with Sharklet wingtiplets, which are mostly operated on medium-haul charter routes, you can now able to hire Samsung Tab 3 tablet computers at a cost of 10euro. The tablets come pre-programmed with several films, video and music, as well as games and newspapers. Finnair's Embraer 170s and 190s have absolutely no form of inflight entertainment. In terms of music on the A330s, Economy Class has 16 and Business Class 18 stereo music channels. 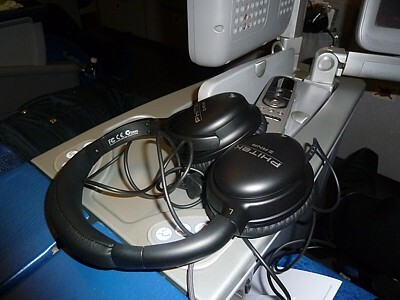 You can start listening to music as soon as you board the aircraft, even though the entertainment system is not otherwise available at that stage. 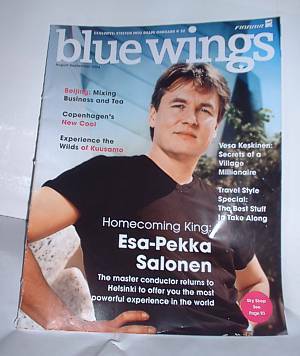 The music program for scheduled flights is also presented in the Blue Wing magazine in the seat pocket. Headphones in business class are good chunky ones, with double 3.5mm pins, however they are not noise reducing headphones. Finnair are one of the few airlines to still charge for headphones in economy on what it calls "leisure destinations" (Canary Islands, and oddly, Dubai) - they cost 2 euro. The English-language inflight magaine Blue Wings is in each seatback pocket. It comes out eight times a year. The 100 pages are actually a surprisingly good read. It is well laid out, in an empty, minimalist way, with understated styling. The Hot Cities section highlights some of the events at locations which Finnair flies to. Hot Cuisine does the same, only with food (and is really only suitable for people with deep pockets). Hot Music (on unusual tunes in Finland) is decidedly offbeat. Hot Sites looks as wacky websites. There is a longer section on just one city in the Finnair empire. There are a couple of articles on technology and business, and a page devoted to good books to read on the beach. In Profile has an interview with a Finnish businessman, who it is unlikely you have ever heard of. On the last page is some surprisingly complex information regarding Finland's economy, GDP, and demographic pyramid, although it would have to be a really really long flight for you analyse the figures in here. is also presented in the Blue Wing magazine in the seat pocket. At the back is the Welcome Aboard section. There's a load of PR guff of little note, and some interviews with the technical staff and cabin crew. There is a page devoted to fleet news, and another page with a map of Helsinki Airport. This is really useful if you have a short connection. Under the movie section is the - rather brief- listings of films. There are the 11 channels for business class, but you have to look at your route sector to see what is on channel 1 or 2 - these are the "blockbuster" channels, and the films on them change according to the route. On the next page are the film synopsis & reviews. The following page lists the music available, with the track list for each channel. Finally, there are a few pages of shopping, and then the route maps. The Finnish-language Lento magazine is published five times a year. Fifty pages long it is pretty incomprehensible, and most readers have a poor opinion, but it has amazingly good photography.